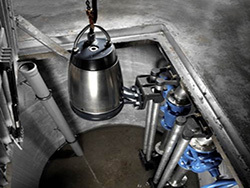 FM Environmental provides an extensive range of pumps and pumping stations for most water and wastewater applications. Through its Projects Department, FM Environmental has designed, installed and refurbished major storm and sewage pumping Mechanical/Electrical projects while also specialising in the production of prefabricated, packaged pump systems for those applications requiring rapid and easy installation. Through its long-established partnering arrangements with such world-renowned manufacturers as Grundfos, Sulzer, Xylem, Hidrostal and Desman, FM Environmental can offer the best, most cost-effective solution to your stormwater, sewage, sludge handling and wastewater pumping needs. To discuss your project needs, please email: sales@fmenvironmental.com or contact 0044 28 302 66616. FM Environmental has extensive capability for MEICA projects – mechanical, electrical and process engineering with associated instrumentation and control. 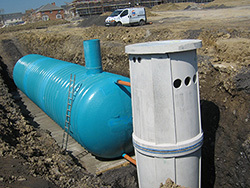 This capability covers assessment, design, supply or construction, (including the supply of pump and overflow chambers (see below image)), commissioning, optimisation and final handover.